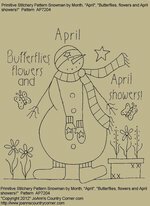 ALL PATTERNS ARE AVAILABLE AS E-PATTERNS AND PRINTED PATTERNS!! Shipping charges will be refunded right away after payment of order. Please free to email me at fortin2@comcast.net if you have any questions. If you do not see your pattern of your choice here, please email me at fortin2@comcast.net I will gladly help you with any information you need. E-Patterns are sent within 24 hours and you will need Adobe Reader 9 to open and download file. Please feel free to email me if you do not have Adobe Reader and I will email you the link where you will be able to download Adobe Reader free! Thank you so much for your order! MONEY ORDER OR CASHIERS CHECK WELCOME!!. 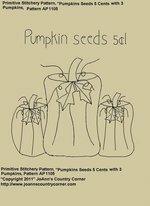 #A588-1 Primitive Stitchery E-Pattern, "Pumpkin seeds 5 cents!" 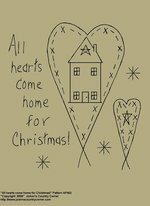 #A591-1 Primitive Stitchery E-Pattern, "All hearts come home for Christmas!" 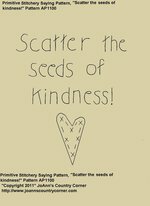 #A593-1 Primitive Stitchery E-Pattern, "Scatter the seeds of Kindness!" 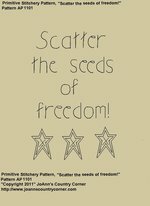 #A592-1 Primitive Stitchery E-Pattern, "Scatter the seeds of Freedom!" 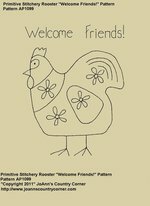 #A594-1 Primitive Stitchery E-Pattern, "Welcome Friends, Primitive Rooster!" 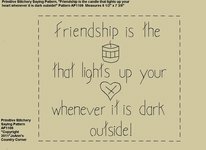 #A597-1 Primitive Stitchery E-Pattern, "Friendship is the candle that lights up your heart whenever it is dark outside!" 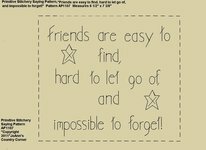 #A598-1 Primitive Stitchery E-Pattern, "Friends are easy to find, hard to let go of and impossible to forget!" Measures 6 1/2" x 7 3/8". 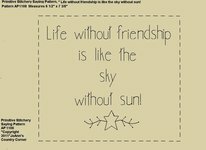 #A599-1 Primitive Stitchery E-Pattern, "Life without friendship is like the sky without sun!" 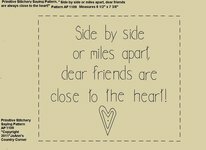 #A600-1 Primitive Stitchery E-Pattern, "Side by side or miles apart, dear friends are close to the heart!" Measures 6 1/2" x 7 3/4". 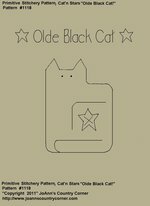 #A601-1 Primitive Stitchery E-Pattern, " Olde Black Cat!" #A616-1 Primitive Stitchery E-Pattern, "Heart Quilt 9 Pattern Set with Primitive Word in Middle of Heart!" #A617-1 Primitive Stitchery E-Pattern, "Heart Quilt 9 Piece Pattern Set with Primitive Words"
Paper Heart E-Patterns measures 8". Words in the 9 hearts are: Family Faith Love, Faith Hope Love, Simplify Believe Faith, Friends Family Faith, Live Love Laugh, Love Hope Joy, Courage Peace Hope, Peace Believe Love, Cherish Dream Faith. 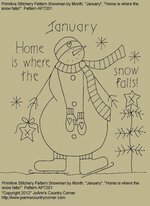 #A618-1 Primitive Stitchery E-Pattern, "Birdhouse Quilt 9 Piece Pattern with Primitive Sayings!" Paper Birdhouse Patterns measures 8". There are 5 patterns with crows and 4 patterns without crows. 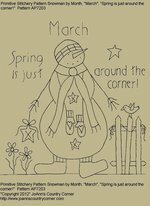 Sayings are: Apartment for wrent!, Home Tweet Home!, Crow's Nest!, Bless our nest!, Bird seed 5 cents!, Every birdie welcome!, Snow birds welcome!, The Gathering Nest!, Cardinal Cottage! #A619-1 Primitive Stitchery E-Pattern, "Sunflower Quilt 9 Pattern Set with Primitive Sayings!" 9 -Paper Sunflower Patterns measures 8". 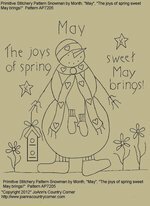 Sayings are: Friendship Forever!, Friendship Matters!, Friends Welcome!, Forever Friends!, Cherish Friends!, Heartfelt Friendship!, Friendship Blooms!, Friends Always!, Friends Together!. 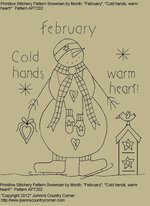 #A620-1 Primitive Stitchery E-Pattern, "Heart Quilt 9 Piece Pattern Set with Primitive Sayings! Paper Heart E-Patterns measures 8" Five of the hearts have a star in the middle of the heart and 4 of the hearts have a heart in the middle.�Sayings are: The family circle never ends!, Families are tied together with heart strings!, A family is a gift that last forever!, A family is a little world created by love!, Family is another word for love!, Family is the circle of strength and love!, Our family tree is blessed with thee!, The love of family makes life beautiful!, Family forever, for always, no matter what!